I have a super busy day of organizing blog posts and wedding preparations but first here are some things I like. 4. this dress. i love the colours so much! I love it! 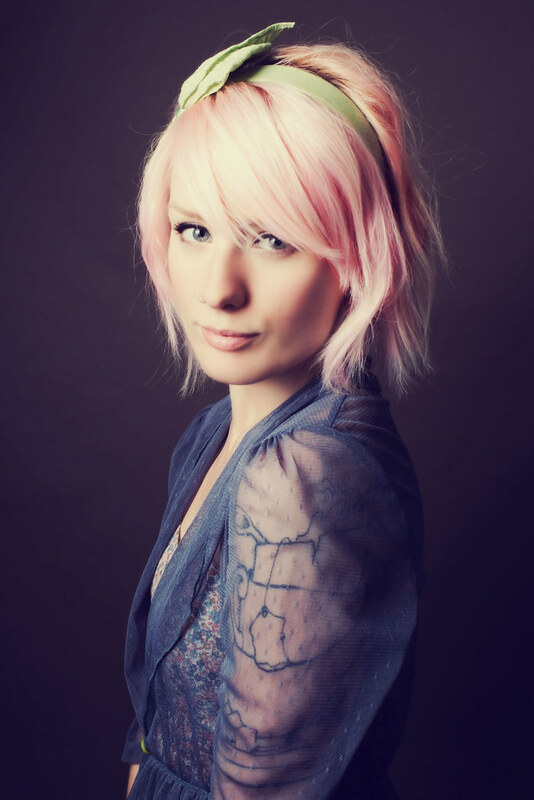 Since December I have had the plan to dye my hair light pink after the wedding (I even have the dye already)! After seeing how great Amanda's looks I even more excited to do it! 2. Tera's "free crappy portraits"
Tera is so so awesome and funny. These drawings look like so much fun to do! So many things I want to try, so little time. 1. (Probably my favourite thing this week) Crossing things off of our "Wedding to-do list". Yeah, it's still pretty large but I'm confident that we will get everything done (at least the important stuff!). Tonight my awesome bridesmaids are having a bachelorette for me. I love surprises so I made sure that I have no idea what we are doing. I am so excited to spend time with everyone. ps. have you stopped by Zoe's blog to check out the giveaways she is having to raise money for her kitty Daisy? Oh, her hair is just perfect! Today I'm getting ready to visit Wales! i always miss my kitties when i travel too! i wish they could follow me everywhere! i love those amazing rings so much!! you're right, light pink hair is beautiful! OH those rings. OH the hair!! You will look amazing with light pink hair!! I love all of your 5 fave Friday! Especially the wooden owl ring! Oh,the pink hair. I'd love to try this but I don't think that I could find a dye like this here in Greece. It would look so lovely on you though! Super cute stuff! LOVE the owl ring. Hope you have an excellent weekend! Sounds fun. I have been eyeing that modcloth dress too! Have a great time tonight!!! That cotton candy pink shade is gorgeous! I think it'll look fabulous on you and I can't wait to see it. have so much fun at your bachelorette tonight lady!! You are so sweet posting my crappy drawing :) I tried to make it to the post office to send you a goodie bag of random things, but I have too many meetings! I will have to go tomorrow :( I hope it doesn't take too long to get to you! Such gorgeous pink hair, omg! Those rings.... that hair... those creepy awesome drawings! Yes! P.S. That dress...oooohmygoodness!! The colors are perfect! oh i think the light pink hair would look soooo cute on you!! i do love me some pink hair! so jealous that it will look lovely on you with your colouring. Those wooden rings are so cool and so is that pretty dress! I love her pink hair as well - who knew it could look that great?! Good luck getting ready for your wedding and I hope you had a fantastic bachelorette party! I absoloutley adore her pink hair!